Hi, I’m Ed Marsh. Welcome to this episode of Signals from the OP. These periodic video blogs let me expand a bit on things I see happening which I encourage executives at industrial manufacturing firms to keep an eye on. Like a military OP, out ahead of the lines and away from the light and noise – able to pick up faint indications of what be getting ready to happen, I work to provide that same kind of early warning of strategic business threats and opportunities. Now I live near the coast and we have some pretty decent tides here, but this isn’t about some prurient local interest story from the news this summer. Rather it’s about the cyclicality of the industrial business. I work with B2B companies, most industrial and many manufacturers. Many of them are actually capital equipment manufacturers and I have some great success stories in the material handling business – fork trucks, conveyors, that kind of stuff. So this headline recently jumped out at me. 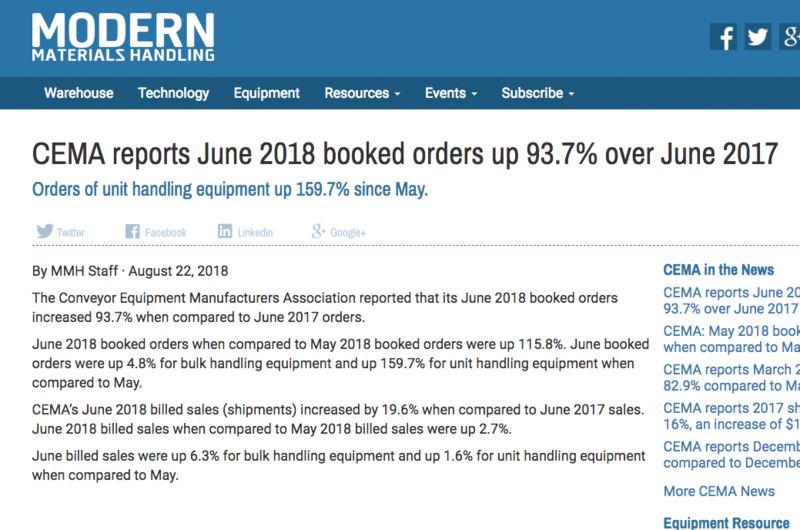 The Conveyor Equipment Manufacturers Association reported that its June 2018 booked orders increased 93.7% when compared to June 2017 orders. That’s almost double the volume year over year! And I see lots of manufacturers facing an interesting and contradictory set of conditions. On the one hand they’re busy. Lead times are long, order books are full. They’re having a hard time hiring enough factory workers. In fact I see companies getting orders just because they can deliver something. It’s that easy to write orders right now. However, when that rising tide starts to go out, the sales challenges become more significant – and that’s why I’m using Warren Buffet’s quote this week – When this tide goes out, companies that aren’t working to fix the underlying marketing and sales issues are going to be embarrassed – actually they’re going to be hurting. Now, am I predicting a recession? First that’s not my gig. Second, I’m not. The small business optimism for July was astounding. Just missed being the highest ever. And as sure as day follows night, when that happens there’ll be teeth gnashing and the first thing folks will do is cut marketing. That’s what the finance folks always recommend – and as companies start to bump up against their loan covenants, the bank may demand it. And while I think that was always a bit silly, in a world where most selling was done directly by field sales people who generated their own leads, the impact of cutting marketing was manageable. It's a different world now – marketing today owns PR, demand gen, most of lead gen, and a substantial part of the sales process - right through the virtual buying journeys that they have to manage via a website. They’ve also got to create critical sales enablement content that helps sales illustrate outcomes and avoid the features trap. So cutting marketing today would be akin to simply saying “we’re going to put in an extra fax machine to handle the volume of incoming orders and cut all our sales people.” You’re going to hear crickets. So you’re worried about finding trucks to carry your products, workers to make them and expensive raw materials to buy – I get it. It’s an inconvenient time to be thinking about driving more leads and sales. But if you don’t take advantage of the good time now – refining sales process, identifying and cultivating target accounts, building optimized content, aligning sales and marketing, establishing a customer focused revenue growth function, etc – you’re going to be digging your way out of a deep hole. Actually that’s kind of mixing analogies – so going back to where I started you’ll find that the riptide strips your bathing suit off, and you’ll be stuck naked as the tide goes out. I’m going to be talking in an upcoming Signals about what industrial companies can learn about marketing and sales from software companies. So if you’re tightening the draw string on your bathing suit, wondering what else you could do to prepare, keep your eye out for that. I think there’s some interesting lessons to be learned. In the meantime, I’m Ed Marsh. Thank you for joining me for this episode of Signals from the OP. If you enjoyed my slightly irreverent approach, please share this and subscribe – either to my youtube channel EdMarshSpeaks.TV or at the related blog SignalsFromTheOP.com.